Home Contests Environment Ready to Win 450,000? Are you ready to win 450,000 pesos? 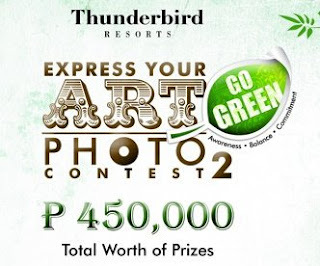 Well, be prepared because Thunderbird Resorts will be giving away a total of P450,000 worth of prizes to the lucky winners of their upcoming,"Thunderbird Resorts Express Your Art Photo Contest" this October. The theme for the second year of this contest is "Environment Sustainability." So for those who want to win, it is best to prepare now, mark the date (October 1, 2010), get that camera ready and your green cause prepared. 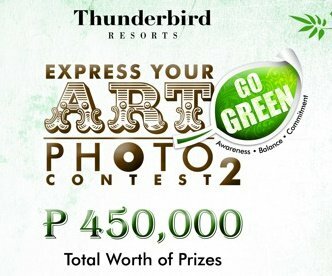 Visit the Thunderbird Resorts website www.thunderbird-asia.com for updates and contest announcements.